Hey guys! This week I would like to explore the history of the Tarot with you. These mysterious cards, with their vast uses through history in politics, religion, and common place entertainment, were not always the divination tools that mystics used to foresee the unforeseeable. Let’s start with the most simple thing about the Tarot deck; the name. A few of the names these occult cards were originally called were Trionfi, Tarocchi, and Tarock. Gaining the acclaim and notoriety they had, in Europe. However, even before these names took hold, they were used as something more simply than the magic cards you know them as. They originated in China as playing cards used as a form of entertainment and a way to place wagers in the place of money. They found their way into the Egyptian culture and then into the Islamic culture when they were called Na’ib, greatly used by solders in times of war to pass the time. They didn’t reach Europe until after the 1360’s. The deck of cards had grown in number through the centuries up to 52 and held. But when the European cultures imbibed the deck, it grew to 78 and now holds there. So what exactly are Tarot cards? A normal deck of Tarot cards have 4 suits. Each of these suits have cards called ‘pip’ cards. They range from 1 to 10 in face value including four pictorial cards totaling 14 in number per suit. In addition to these 4 suits, the Tarot has trump cards totaling 21 and finally a single card holding the most common title of Fool. This single card in most decks is categorized as the top trump card. Now these cards were used in a variety of games thought Europe as well as as used by fortune tellers. But they were also used in more secretive ways to pass valuable information from one source to another. This is absolutely fascinating to me. If someone did not want to write a letter containing important secrets that might fall into the hands of a nefarious individual during a long journey for delivery, the tarot was used to communicate this information. There were usually two parties with two decks both speaking different languages so they would not be able to verbally converse with one another. The receiving party would present cards that would pose a question. And the party delivering the message would present a combination of cards that would answer the questions in detail. Not a single word was spoken during these transfers making the delivery of information virtually undetectable to an outside party. So, how are the Tarot used nowadays? Well in many ways in fact. They are still used to some extent as playing cards in complex games, but most commonly in ways of diving the unknown. 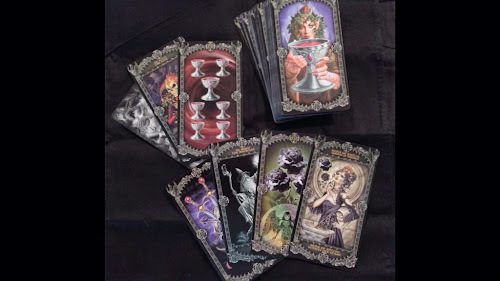 Fortune tellers, occultists, and psychics can use these cards to tell you your future, your present, and your past. They can be used as a bridge, to communicate with other plans of existence, and with the dead. They can be used in ways to cast spells to influence people and events. Finally, they can be used to help someone make a difficult decision that would benefit them the most. In closing, whatever you believe in, you must remember this one fact about the Tarot deck. It is just a deck of cards. It is not until a human gives them a purpose when they pick up the deck and begin to use them. I hope you all have a very adventurous week!